I’ve about had it with this whole G+ Custom URL thing. I’ve been anotherschwab on the web since setting up my hotmail account in 1997. I’ve been anotherschwab on Yahoo, Excite and a bunch of other services that have come and gone. With the rise of twitter, @anotherschwab became the name I used in real life at edtech conferences to introduce myself to fellow twitter users. anotherschwab is my Neo to Keanu Reaves’ Tom Anderson in The Matrix. Which name is my real name anyway? 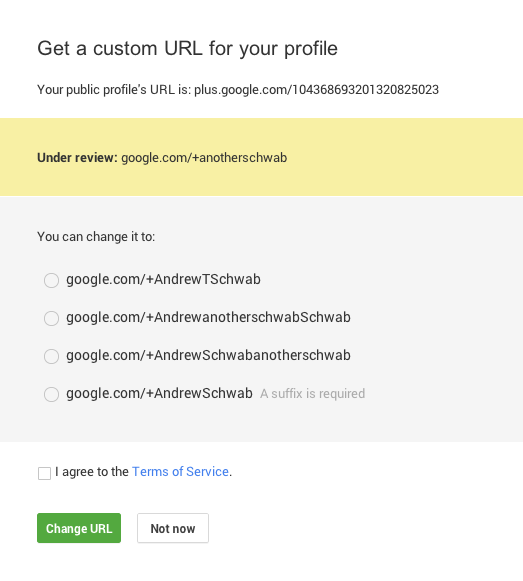 So when Google+ custom URLs starting becoming available, I immediately requested +anotherschwab. A request that has now been pending for over a week. I requested +anotherschwab not because I’m not +AndrewSchwab or +AndrewTSchwab (frustratingly +AndrewSchwab is stuck to my Work Google+ account and when I tried switching the names around I lost my Verified status on my personal G+ account and got that goofey add suffix option to boot) but because everything I do online ties back to anotherschwab. It’s the name I use to sign into Google+ for crying out loud! What’s next, making us change gmail account names to be our “real” names? Interestingly enough there is a (more?) famous Andrew Schwab out there on the Interwebs. TheAndrewSchwab isn’t me (but apparently I beat him to twitter when I grabbed Andrew Schwab just in case) but we both have the same name. So who’s to say who should be +AndrewSchwab or +AndrewtSchwab or even +TheAndrewSchwab on Google+. How is +TheAndrewSchwab any more real of a name than +anotherschwab? What if I choose +AndrewSchwab3? How am I distinguishable online from +AndrewSchwab2 or +AndrewSchwab222? This whole G+ custom URL thing is totally goofey. I’m anotherschwab online. I always have been and always will be and until Google wakes up and lets me identify myself how I want, I’ll still be 104368693201320825023 (unless they force something else on me). How about it, are you happy with your Custom URL options? PS: I ended up with anotherschwab because after spending way too much time flipping through crazy first name, last name, letter combos on hotmail (I was late to that party), I finally gave up and said if there are so many aschwab’s out there, I must be just anotherschwab. ← A Family Friendly EdTech Event?